Today’s tutorial is another Halloween inspired look! I recently picked up this cute headband and pretty soon this costume idea fell into place. 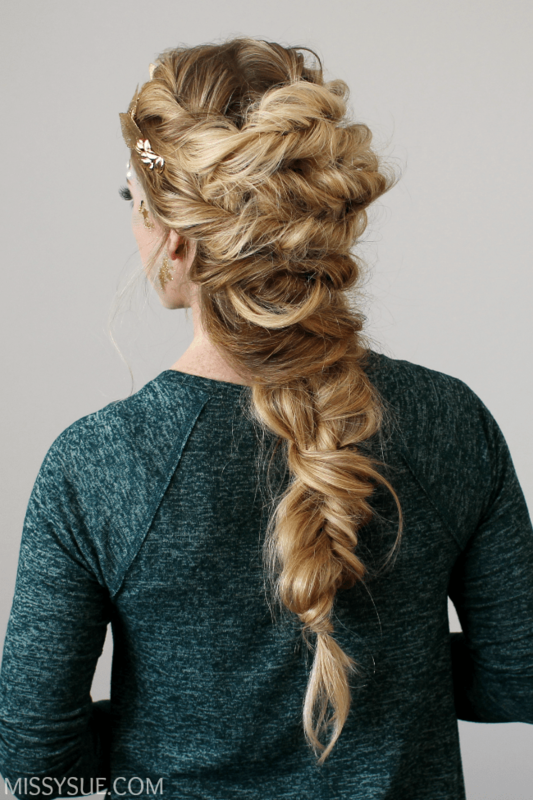 I love this Twisted Mermaid braid and think it could be worn any day of the week as well! It’s created with a bunch of little twists anchored together by a french braid that finishes in a fishtail braid (of course)! 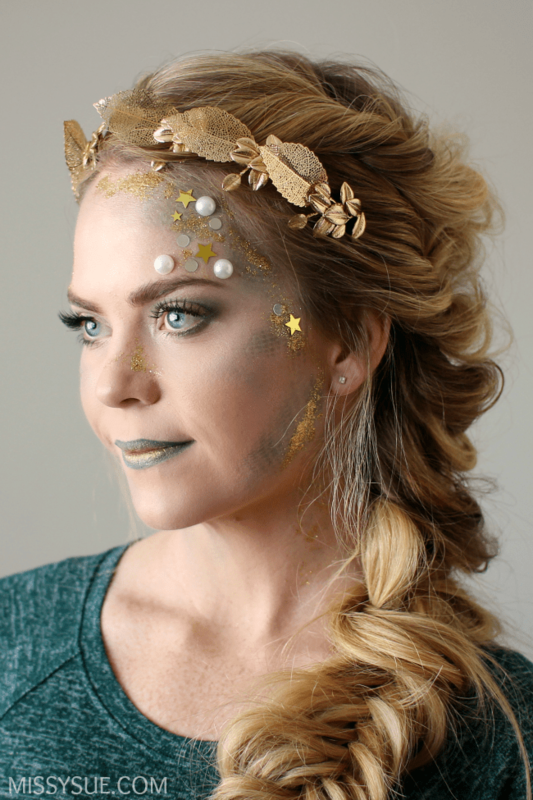 Top off the look with a pretty crown and fancy makeup and you can be a fun mermaid princess this coming holiday. 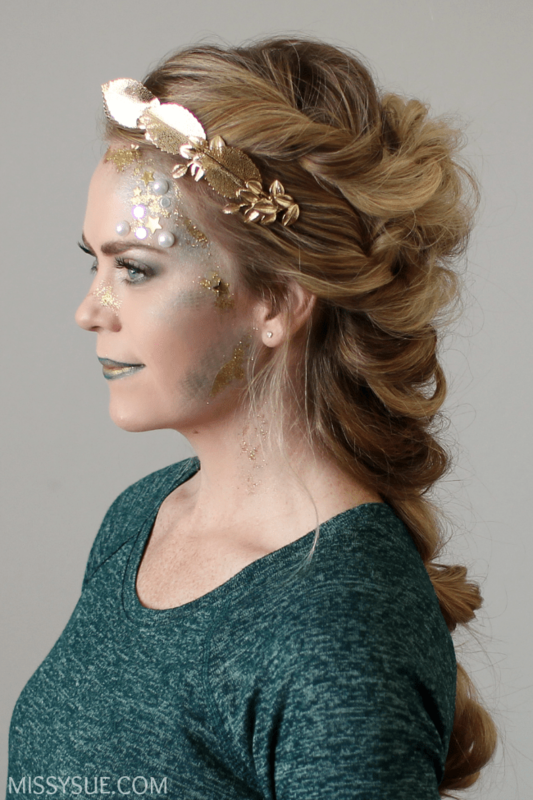 Find more great Halloween and Mermaid hairstyle ideas here! Step 2 / Divide the hair into three vertical sections, a right and left side, and a middle section at the back of the head. Step 3 / Clip the left and right side out of the way with two hair sectioning clips. Step 4 / Create a french braid with the middle, back section; braiding the very of the hair into a fishtail braid before tying it off with a clear elastic band. Step 5 / Remove the clips from the side pieces. Step 6 / Separate off a 1″ section of hair near the top of the hairline on the right side. Step 7 / Twist the section together then gently pull on the edges of the twist to make it fuller. Step 8 / Lay it across the french braid, towards the left side, and pin down the twist, anchoring it with the french braid. Step 9 / Separate off a 1″ section of hair on the left side, repeating the previous steps, twisting it, pulling it apart, and draping it underneath the first twist, pinning it in place. Step 10 / Continue picking up alternating sections of hair, twisting them, and draping them over the french braid until all the hair is twisted and pinned. Step 11 / With the last section of hair, drape it over the braid before wrapping it a second time around the braid and pin it underneath, at the nape of the neck. Step 12 / Add a pretty gold headband and spray the style with a firm hold hairspray to finish off the look. You always make putting just one bobby pin in and making it stay look so easy…. How do you do it!? I have to use at least 2 and criss-cross them so it will stay. Maybe my hair is just too heavy? Help?? Ok, I feel a little better. :) So do you have any tips on the best ways to use the bobby pins so that they stay the longest? This is amazing! I can’t wait to try it out!!! I LOVE this! Thanks so much for all your posts! Do you have any hairstlyles that would work for short hair? I love your videos! Can you tell me please where you got the metallic ‘headband’ in the mermaid video? Love all your tutorials! You may have answered this before, but do you have a favorite brand of Bobby pins? I have fairly thick hair and I feel like mine never hold the hair right enough. Thanks! Wow, this hairstyle is gorgeous! I am going to try it out today. Would you be able and willing to make a post about how you did your makeup? That would be wonderful. I love this look! And your mermaid makeup is just gorgeous!